I had received quite a few of these se-tenant stamps since its issue in 2014 before I looked closely at the lettering and discovered that it was not a view of Hamburg as I had assumed (I know, I know...) but was actually a view of Dresden. Well, at least both cities are on the same body of water - the River Elbe. But, while Hamburg is closer to the border with Denmark, Dresden is close to the border with the Czech Republic. This stamp shows the view of the (south) left bank of the river with the Frauenkirche, the castle, opera house, museum, and Bruhl's Terrace among other buildings in the historic inner city. There is still ongoing reconstruction after the devastating bombing of the city in 1945, but it also has to contend with severe flooding, the worst being in 2002 and the most recent in 2013. And it suffered the indignity of having UNESCO remove the city's World Heritage status after a modern bridge was built (Waldschlösschen brücke) in 2007 to alleviate traffic (a plan that had been in the works for 100 years already). That bridge isn't shown here, though. I believe it is the Augustus Bridge on the far right that you can see. arrived in my mailbox this week. 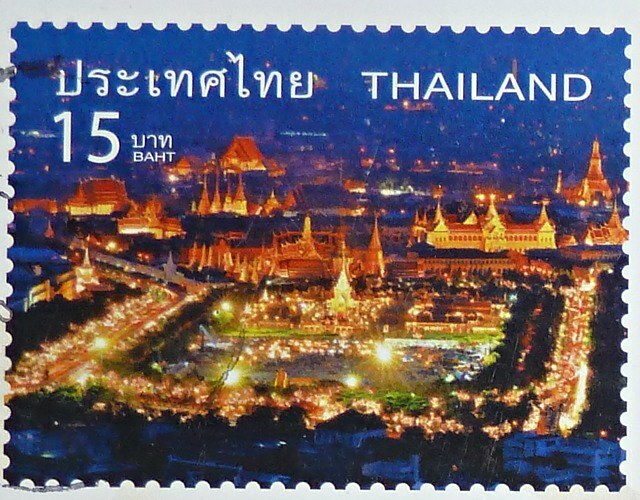 It took a lot of time to find out that this stamp - on a prepaid postcard - was issued in 2015. There was no description on the card and the sender wrote only of the beaches in Thailand and nothing about the temples. That was nice to read about, but did nothing to enlighten me about the view. So, I took a stabbing guess that this is a night view of Bangkok. 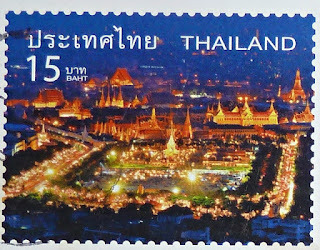 And that some of the temples lit up for our enjoyment are Wat Pho (Temple of the Reclining Buddha), Wat Arun (Temple of Dawn), Wat Phra Kaew (Temple of the Emerald Buddha). For a more illuminating background on these, and other, temples, check out this tourist website. I love the stamps you show, and the explanations. Sometimes is quite frustrating when we it is difficult to find out what is depicted on the stamps we get, isn't it? But you did a great work this time. I know! I spent well over an hour pouring over maps and images and descriptions of Bangkok... admittedly, I also got sidetracked by the information! Anyway, maybe someone who has actually been there can offer a better description. they do! I am a bit conflicted about city lights, but have to admit buildings lit up from the outside are awfully nice. I like the reflections in the water on those. cities on rivers do have that advantage of nice reflections, don't they. btw, I can't comment on your blog, for some reason, but I am keeping up with your writings. I'm learning more about the stamps I have thanks to Sunday Stamps - I like to see others' stamps that teach me things as well; love both these. Isn't this a fun way to learn?! The perfect use se-tenant stamps. Beautiful romantic view of Bangkok. Well done on your research, there is always a lack of info on prepaid postcards both on and offline.